At the GigaOM Mobilize 2011 Conference today in San Francisco, T-Mobile showed off the latest additions to its selection of 4G phones. 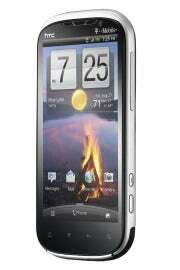 Versions of the Samsung Galaxy S II and the HTC Amaze 4G, which is a camera-centric phone, will be available for pre-sale online beginning Oct. 10 and in stores on Oct. 12. 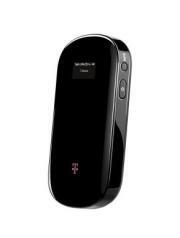 T-Mobile also announced the Sonic 4G Mobile HotSpot, which will also take advantage of the network's faster speeds. The T-Mobile version of the Samsung Galaxy S II is a bit different from the AT&T and Sprint versions we've seen. Rather than a Samsung Exynos processor, the phone ships with a Qualcomm Snapdragon S3 1.5GHz dual-core processor. It also supports Near Field Communication (NFC) for making mobile payments, unlike the Sprint version, the Epic Touch 4G. (The AT&T version has NFC support, however). This is excellent news as Google just launched its NFC app, Google Wallet. We saw the T-Mobile Galaxy S II briefly at the U.S. Galaxy S II launch event in New York City in August, but we weren't allowed to touch it. The phone has the same size Super AMOLED Plus display as the Epic Touch 4G--4.52 inches--and appears to be more rounded than the other two versions. The Galaxy S II runs Android 2.3.5 with Samsung's own custom overlay, TouchWiz 4.0, running over it. The Galaxy S II will cost $229.99 after a $50 mail-in-rebate card and requires a two-year contract. While the Galaxy S II is certainly an exciting addition to the line-up, I'm more excited about the HTC Amaze 4G. The Amaze 4G is a camera-centric phone that boasts an 8-megapixel backside illuminated sensor and a wide variety of shooting modes. The last camera phone HTC and T-Mobile teamed up on was the T-Mobile myTouch 4G Slide, which we declared had the best camera on a smartphone to date. Like the myTouch 4G Slide, the Amaze 4G has 1080p HD-video capture, an HDR shooting mode, a panoramic mode, and claims zero shutter lag. The Amaze has the same Qualcomm S3 processor as the Galaxy S II and runs Android 2.3.4. T-Mobile says the Amaze 4G will also run HTC Sense over the Gingerbread OS, but I'm guessing we'll see a similar camera user interface as the myTouch 4G Slide uses, which isn't on other HTC Sense phones. 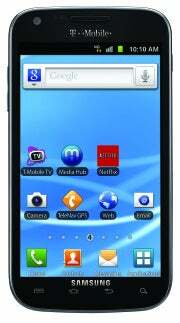 The Amaze has a 4.3-inch qHD super LCD display and will also have NFC support. Kudos to T-Mobile for shipping not one, but two phones with NFC support right in time with the Google Wallet launch. The HTC Amaze 4G will cost $260 after a $50 mail-in-rebate card with a two-year contract from T-Mobile. The Sonic 4G can connect up to five Wi-Fi enabled devices, like your laptop, iPad, camera, etc. Manufactured by Huawei, the Sonic weighs only 3.88 ounces and comes equipped with an SD card slot that can hold up to 32GB of expandable memory. It also has a small OLED display that shows signal strength, number of devices connected, number of unread text messages, connectivity to the Internet, battery level, and network connection type. The Sonic will be available in October online and in T-Mobile retail stores, but pricing has not been announced.